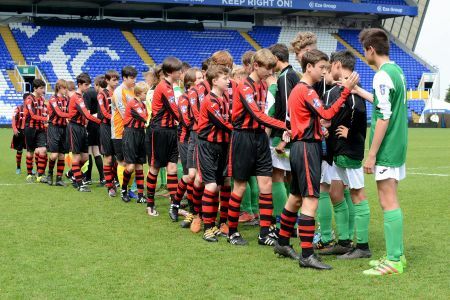 From Monday 9th – Wednesday 11th May, Birmingham City F C opened their doors to the English Schools’ FA and hosted six National Finals across the three days at their fantastic St Andrew’s Stadium. 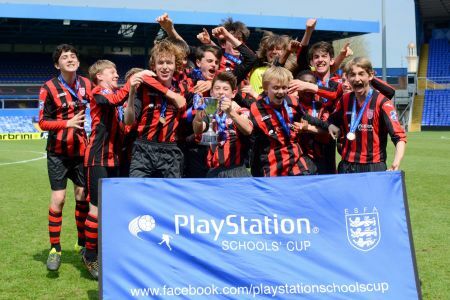 All six of the ESFA and PlayStation Schools’ Cup matches were broadcast live online via the ESFA YouTube channel, courtesy of 247.TV and the videos online have since received thousands of views. 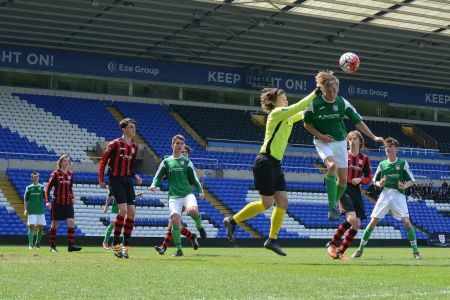 Weydon School v Cardinal Heenan’s PlayStation Schools’ Cup U15 fixture headed up the six finals at Birmingham City on Monday 9th May. Weydon School kicked the game off and it didn’t take them long to get a foot hold on the match. In the first minute of the match they were awarded a free kick in a dangerous area. The shot came in but Cardinal Heenan keeper, Ellis Mooney, caught the ball and threw out to relieve the early pressure. Cardinal Heenan were slow to get into the game as the first 10 minutes saw Weydon School pressing hard, using the pace they had down the left wing. The first real chance of the game fell to Weydon School after 20 minutes. Tyler Carrington brought the ball forward from midfield and took the shot on himself, only to hit the ball wide of the goal. Weydon were awarded yet another free kick on the edge of the area, the keeper choosing not to move the wall and Mark Richardson stepped up to have a shot on goal, but again was saved by Ellis Mooney in the goal. Cardinal Heenan’s first chance in the game came just 3 minutes before half time. The ball was brought forward and the attacking player saw the keeper rushing out to try and claim the ball. He tried to lob the ball over him, but the ball sails wide of the post. Once the ball was cleared Weydon had the best chance of the match and should have been in front. The ball was played from the right hand side straight into Jack Scorah’s feet, he hit hard but straight at the keeper for the save, denying their chance to be in front just before half time. Cardinal Heenan came out after half time the stronger team and 5 minutes in they got a great opportunity to put themselves in the lead. A free kick from the wing looped over all of the players in the penalty area and hit the side of the net keeping the game goal-less. Only a minute later and Cardinal Heenan were picking the ball out of the net. A free kick was taken on the right wing and put into the far post. Tyler Carrginton was first to react and headed them into the lead with a powerful header. Cardinal Heenan had a shot from outside the box from substitute, Andrew Howard, which sailed wide of the post. With 10 minutes to go Cardinal Heenan’s pressure saw them rewarded with their first goal. The ball was played long from their own half and bounced in favour of Fariki Gore. Both Weydon’s defenders left the ball to run through to the keeper but Gore hit the ball past him into the goal to draw his side level. There was only 5 minutes to go and Cardinal Heenan got another goal. This time a volley from Captain, Matthew Griffiths, from the edge of the box saw his side go ahead for the first time in this match. 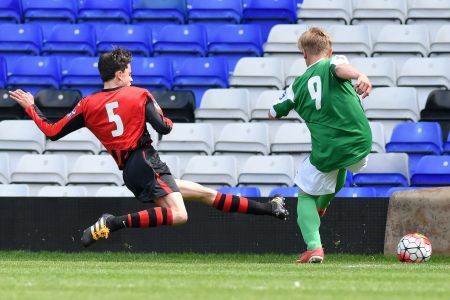 Weydon School were forced into make a few changes when the goal went in, bringing back their attacking players but with only 5 minues on the clock it saw Cardinal Heenan slowing the game down and kicking the ball into the corners. Cardinal Heenan kept the ball and the referee blew for full time, crowning them National Champions for 2015/16 after a great comeback from being 1-0 down with only 10 minutes on the clock. Both teams were presented with their commemorative medals and winning goal scorer, Matthew Griffiths lifted the trophy in front of the travelling Liverpool supporters. Photos for the game are available from 353 Photography to view the album, please click here. The full match can be viewed by going onto the ESFA’s YouTube channel and a huge thanks to 247.tv for streaming this match live on the day.